My nephew and sister are on their way here and I wanted Riley and Aidan (my nephew & godson) to have a cute, healthy snack once he got here. My first attempt with carving watermelon went so well with my baseball mitt fruit salad that I thought it was time to try out something else. I decided on using cookies cutters to create sparklers. So fun! I started out by cutting about a one inch slice of watermelon. 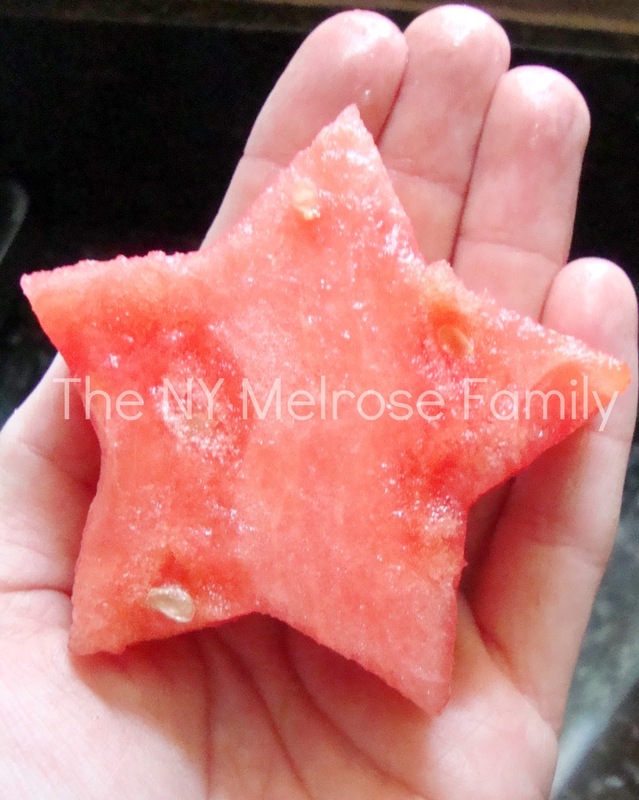 I then placed my star cookie cutter in the flesh of the watermelon and pressed down. It popped out perfectly! Riley was sleeping while I made these, but the next time I will definitely have her help me because she’ll be able to use the cookie cutter with ease. This honestly was one of the easiest things I’ve ever done. So perfect! I then used bamboo sticks that are normally used for kabobs, which is what we use for our steak bites shish kabobs. 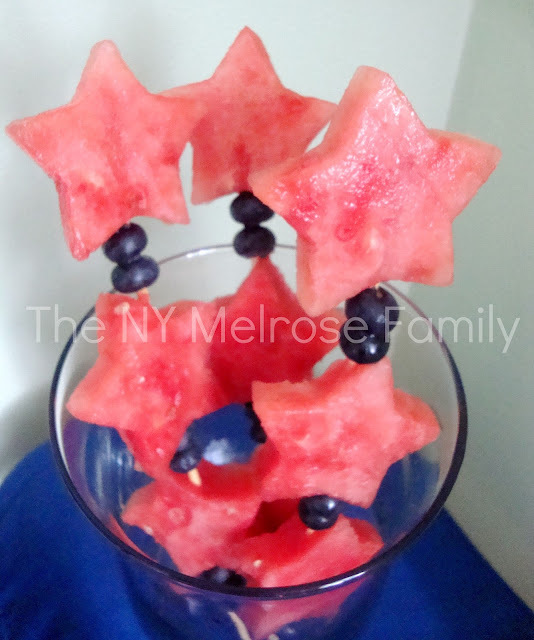 I simply pierced two blueberries and then added a watermelon star. As an elementary school teacher, I’m all about patterns for Riley. I always seem to have an end game. I made sure not to pierce through the last star so it gave it a finished sparkler look. I love how they came out. They are perfect for any summer picnic. So cute! And healthy too! Perfect treat for a hot summer day! 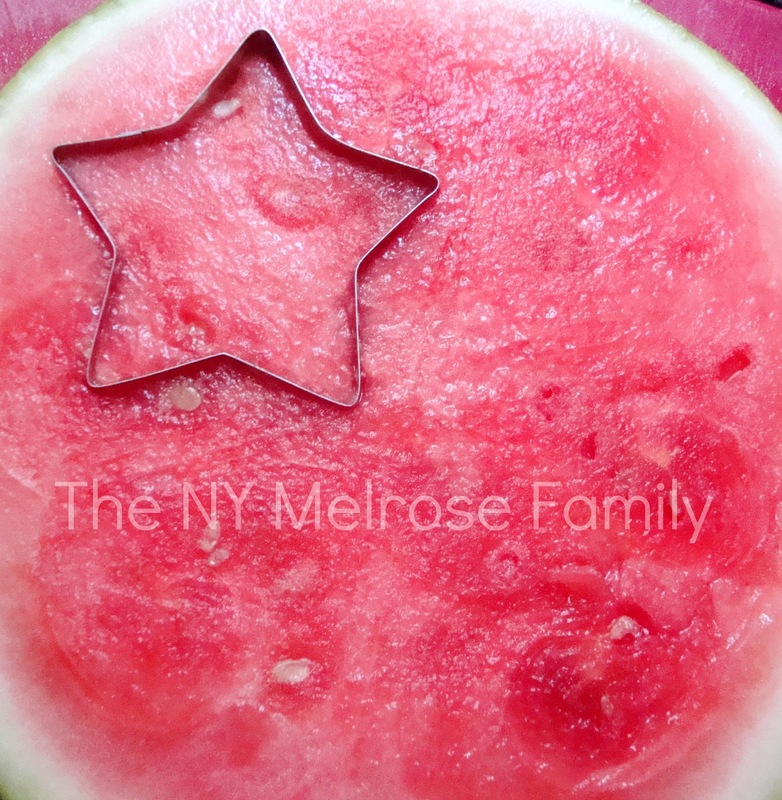 This is making me want some watermelon…. what a simple way to add some visible appeal to any table! Now how cute is that, I will be copying off of you and make this for our pool playdate, the kids will love this 🙂 Thanks for sharing my friend! YUMMY…what an amazing idea and patriotic too! These are so cute! 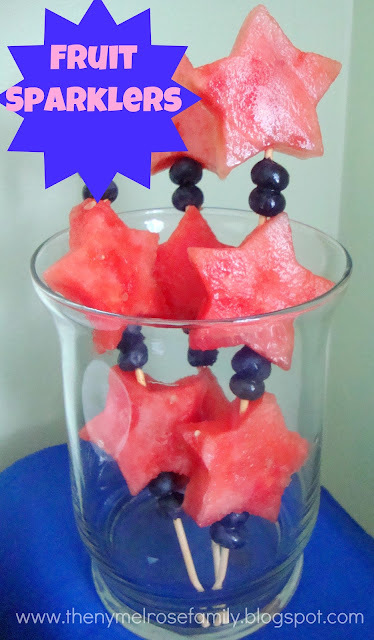 I'm in charge of fruit for the 4th…might just have to give this idea a try! Thanks for sharing – found you at Craft-O-Maniac Monday party. Ooh, thanks for sharing. I think I will bring this to our family party on Wednedsday! I love them! Such a simple but really stunning idea. And a great way to get kids into the more healthy snacks! LOVE this!!! So cute and simple! What a great idea!! Might see these at our house on the 4th!! Thanks!!! So cute- I'm doing this same thing almost for Wednesday for a party i'm going to. But I'm adding brownie bites and marshmallows. thanks for the helpful tips! Adorable and easy- just like I like it! Happy Independence Day to you! I'm planning to try something similar to this because kids love fun shapes and pretty much anything on a stick. Cute and healthy. Very cute! I am sharing these on my FB page tomo! You are going to put the people at edible arrangements out of business. This is adorable! I love these! I'm going to make them for the 4th. Thanks for the idea. That looks delicious! Thanks for sharing the idea! Hits the spot for me – beautiful healthy and fun. These are adorable! My kids would have fun making (and eating) these. What a great idea – so festive! Those look yummy! Thanks so much for linking up at One Creative Weekend! This is fantastic! I hope you will link this up to The CSI project this week starting Wednesday. The challenge is Frozen treats and Push Up Pops. You just might win. Each day we have a fun tutorial and on Wednesday you can start linking up! Love these!!! My toddler and hubs would eat these up. Hope you had a happy 4th! My son is so into watermelon right now that I think he would love these. Thank you for sharing at Saturday Show and Tell! I hope you'll be back this week. So cute!! I pinned it to my Patriotic Board so I can remember it next year! Thank you for sharing at Sharing Saturday! !